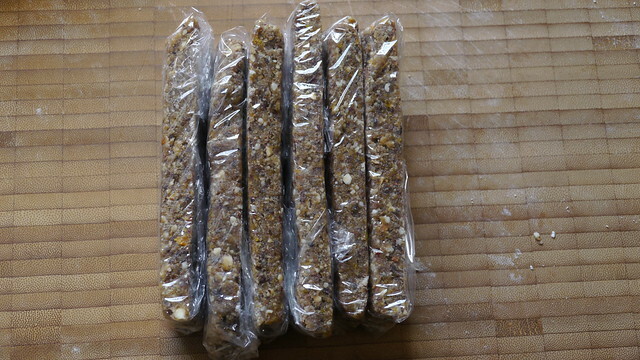 Two years ago I wrote an first article about some MYOG trail bars and now it is time for another recipe. On my last trip in the Engadine I carried some fruit bars from Seitenbacher. These bars were splendid, but very expensive when you buy a big batch for a longer trip. Simultaneously Markus also carried some fruity bars on this trips, but MYOG ones. The taste of them was perfect so I decided to try a batch on my own. Main components of these bars are dates and almonds to get a basic strength and a certain tackiness. 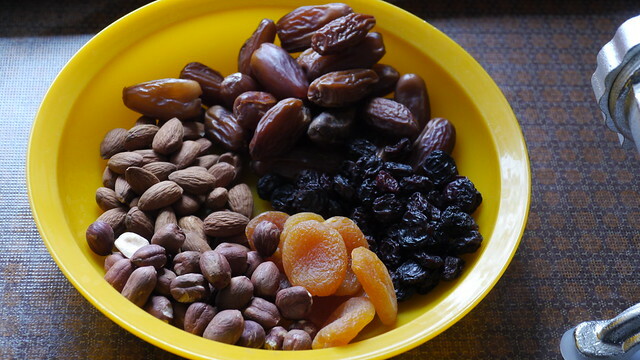 You can refine these with other dried fruits and nuts. 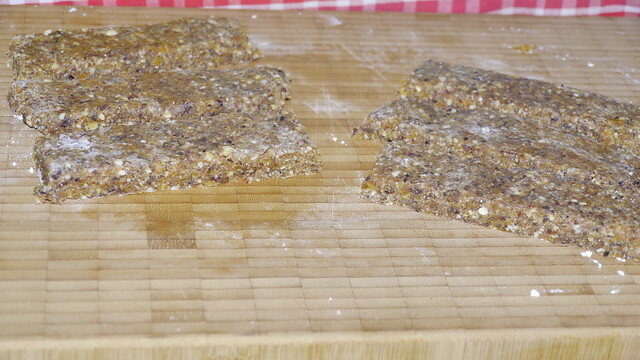 Here is my recipe for the first batch of these fantastic bars. Ingredients for the fruity bars. 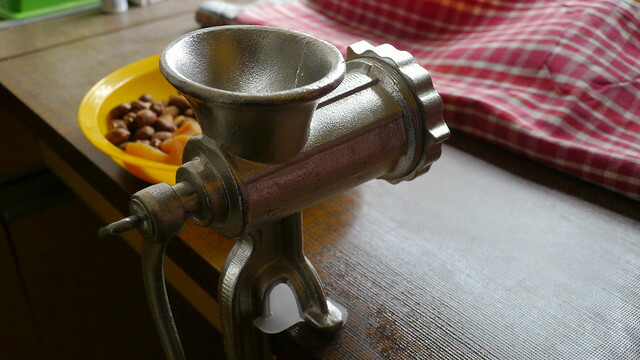 To get consistency of the bar you need a meat grinder. 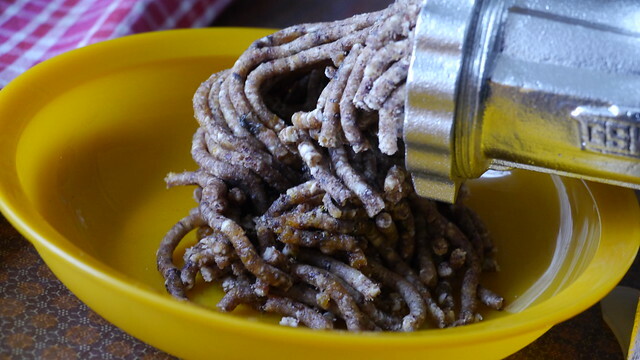 Put all ingredients into the meat grinder and grind them. After that you get a fruit/nut dough. Knead this several times in a bowl to get a uniform dough. 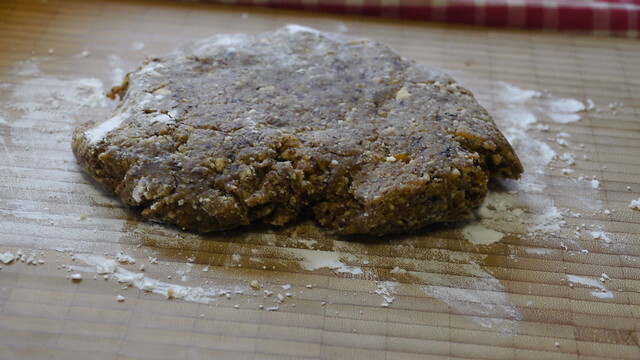 Roll out the dough on a kitchen board. If it is too sticky put a bit powdered sugar on the bowl. At least cut the dough into pieces..
and wrap it into a thin foil. Now you can store these bars in the refrigerator until your next trip starts. Enjoy making your own fruity bars. It is a lot of fun to test several ingredients and it is so easy.